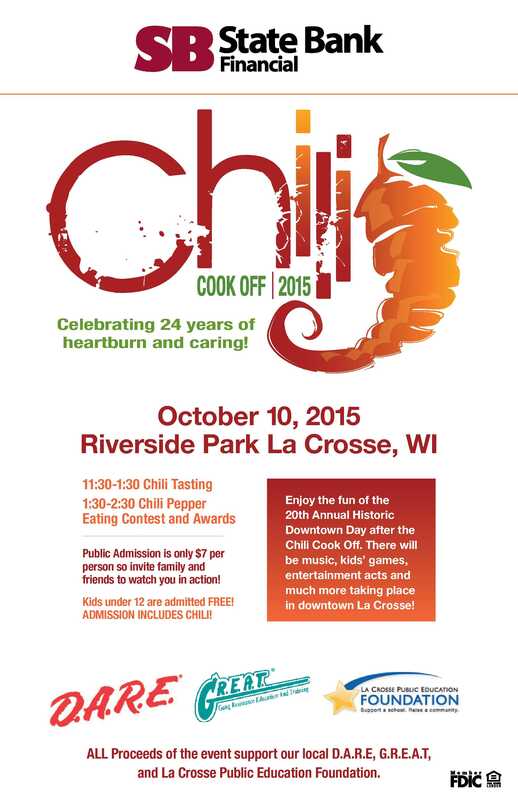 This Saturday, October 10th, members of the La Crosse Police Department will join other members of our community for the 24th Annual State Bank Financial Chili Cook Off! The Chili Cook Off will be held in Riverside Park from 11:30AM to 1:30PM, with a chili pepper eating contest and awards ceremony from 1:30PM – 2:30PM. Chili tasting admission is only $7 with FREE admission for children 12 and under. Throughout the past 24 years, your support of the Chili Cook Off has provided over $200,000 to the area D.A.R.E. and G.R.E.A.T. programs! Proceeds from this year’s event will benefit the La Crosse area D.A.R.E. and G.R.E.A.T. programs, as well as the La Crosse Public Education Foundation.